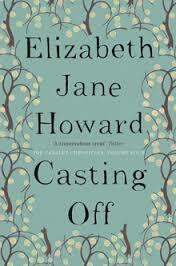 Casting Off is the fourth in the series of the Cazalet Chronicles, and until 2013 when EJH added a fifth book, the final instalment for the Cazalets. It brings back some of the ‘minor’ characters as well as the stories of the main characters – Polly, Clary and Louise. It does have the feeling of wrapping up the lives of the Cazalets, and had this been the last, I think I would have been satisfied by it. During Casting Off, I was a little disgruntled to be spending time with the likes of some of the other cousins (Nora, Simon, Christopher, even Angela), but it did tie everything together neatly. I had grown fond of Polly, Clary and Louise, and it was their lives that interested me the most. I was not disappointed. In Casting Off, Howard’s themes are nonetheless significant, and she continues to explore the role of women in marriage and society in this post-war world. The opening deals with the return of Rupert, revealing his story to us (readers) and to the family confidant Archie. Howard’s examination of the painful reconciliation between Rupert and Zoe is wonderful, both of them lost in their own loss and withdrawn from each other. Witnessing their relationship develop was one of the highlights in Casting Off for me. Howard continues with her theme of infidelity, and moves things on for Edward and Diana, casting off Villy in the process. Villy becomes an embittered woman, living with Miss Milliment and her son, Roland. No one much likes Edward, who’s life becomes isolated from the Cazalets. You have the feeling that it will come back to haunt him, and certainly I had no time or affection for the rather vulgar Diana. I didn’t much feel sorry for Villy either, but rather saddened by the sorry state of things. Both Polly and Clary experience pain and rejection in their first loves, beautifully observed by Howard. Clary’s chaotic, impressionable, vulnerable character comes through, to disastrous consequences for her – events that made me weep for her. The ultimate resolution for her, even though she achieved success in writing in the process, was perhaps a little farfetched for me, but it tied things off. Archie plays a significant part in Casting Off, as harborer of secrets, and also rather more of a white knight. Of all the characters, I think Howard was most sympathetic to him. Casting Off is a wonderful book, and is an equal match to its predecessors. Having read All Change, the final installment, if you wanted to end here, you could easily. All Change is good, but the others are great. The 4th of the Cazalet Chronicles – I enjoyed some parts of this book much more than others as some of the characters are not nearly as pleasant as others. Half way through, I discovered that there is in fact a fifth book to look forward to.